Macau casino operator SJM Holdings Ltd announced on Wednesday that company profit for full-year 2017 declined 15.6 percent in year-on-year terms to HKD1.96 billion (US$250.8 million), while total revenue and gaming revenue showed “modest increases”. SJM Holdings’ board proposed a final dividend of HKD0.15 per share for 2017, subject to shareholder approval. The casino firm reported total revenue of HKD41.9 billion for the full year, up 0.2 percent from the previous year. Gaming revenue accounted for 98.6 percent of the company’s aggregate revenue. SJM Holdings recorded annual adjusted earnings before interest, taxation, depreciation and amortisation (EBITDA) of HKD3.07 billion, down 10 percent from 2016. The group’s adjusted EBITDA margin – on a Hong Kong generally accepted accounting principles basis – decreased to 7.3 percent in full-year 2017, from 8.2 percent in the prior year. Gaming revenue was HKD41.29 billion for the 12 months ended December 31, representing a slight increase of 0.1 percent from the previous year. VIP gaming revenue declined by 0.3 percent year-on-year in 2017 to nearly HKD19.88 billion; mass table gaming revenue was up by 0.6 percent to HKD20.58 billion. Slot machine and other gaming revenues posted a slight annual decline, said the firm. The results were “in line with share loss in mass continuing” as a trend for SJM, said analysts Vitaly Umansky, Zhen Gong and Cathy Huang of brokerage Sanford C. Bernstein Ltd in a Wednesday note. VIP gaming operations accounted for 48.1 percent of SJM Holdings’ total gaming revenue in 2017, as compared with 48.3 percent in the previous year. Market-wide Macau casino gross gaming revenue (GGR) rose by 19.1 percent year-on-year in 2017 to MOP265.74 billion (US$33.02 billion), according to official data. That included a 26.7 percent increase in market wide VIP gaming revenue and a 10.4 percent increase in mass-market revenue. SJM Holdings said that during 2017 it had a 16.1 percent share of Macau’s gaming revenue, including 20.8 percent of mass-market table gaming revenue and 13.6 percent of VIP gaming revenue, according to Wednesday’s filing. “Macau saw the beginning of a turnaround in its casino gaming market in 2017, and SJM has entered 2018 in a strong position,” said SJM Holdings chief executive, Ambrose So Shu Fai, in a statement included in a press release also issued on Wednesday. Mr So said construction work for the firm’s new casino resort, the HKD36-billion Grand Lisboa Palace in Macau’s Cotai district, made “substantial progress” in 2017. “We are still striving for construction to finish by the end of this year,” he added. Earlier this month, the SJM Holdings CEO said the company was aiming to start operations in Cotai in 2019. Development of the Grand Lisboa Palace has been plagued with delays. Brokerage Sanford Bernstein said in a note this month that it expected Grand Lisboa Palace to open in “late 2019 or even early 2020”. As of December 31, SJM Holdings had 279 VIP gaming tables in operation and had partnerships with 19 VIP promoters, compared with 315 VIP gaming tables and 20 VIP promoters as of December 31, 2016. The company operated a total of 1,424 mass-market gaming tables in its casinos as of December 31, compared with 1,301 mass-market tables a year earlier. 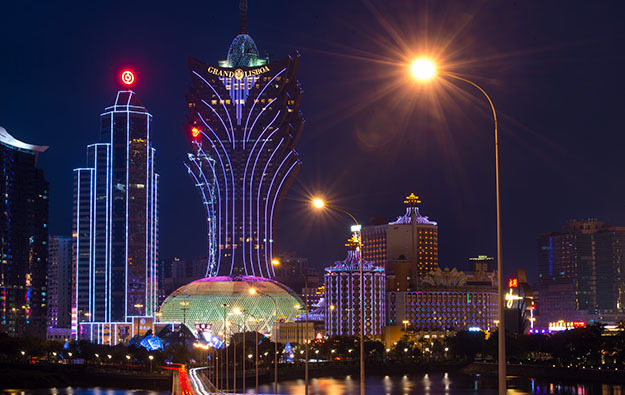 SJM Holdings’ Grand Lisboa casino hotel (pictured) reported a 5.8 percent year-on-year increase in gaming revenue in 2017 to nearly HKD14.87 billion. The flagship property recorded an adjusted property EBITDA decrease of 5.1 percent as compared to the year-earlier period, to HKD1.68 billion. The firm’s 16 satellite (third party-promoted) casinos generated annual gaming revenue of approximately HKD20.21 billion, down 5.5 percent from 2016. Profit attributable to SJM Holdings from those operations amounted to HKD656 million last year, a year-on-year decline of 13.4 percent.